JACOBUS KELLER was born Abt. 1623 in Bernhardzell, St. Gallen, Switzerland. He married ANNA HENGARTER 1648 in Switzerland, daughter of JOHANNES HENGARTER and CATHARINA BRENNER. She was born Abt. 1625 in Bernhardzell, St. Gallen, Switzerland. i. CHILD KELLER, b. May 04, 1649, Bernhardzell, St. Gallen, Switzerland. ii.JOHANNES KELLER, b. February 28, 1650/51, Siblingen, Kanton Schaffenhausen, Switzerland. iii. SABASTIAN KELLER, b. June 20, 1659; d. March 10, 1733/34. iv. JOSEPHUS KELLER, b. November 30, 1660 in Bernhardzell, St. Gallen, Switzerland. v. URSULA KELLER, b. March 24, 1663, Bernhardzell, St. Gallen, Switzerland. vi. ANNA KELLER, b. June 26, 1664, Bernhardzell, St. Gallen, Switzerland. vii. BARBARA KELLER, b. January 16, 1665/66, Bernhardzell, St. Gallen, Switzerland. JOHANNES KELLER (JACOBUS) was born February 28, 1650/51 in Siblingen, Kanton Schaffenhausen, Switzerland. He married ANNE SENN 1654 in Switzerland, daughter of HANS SENN and MARGRETH HESS. She was born 1654 in Schaffhausen, Switzerland. i. BASTIAN KELLER, b. 1680, Schaffhausen, Switzerland. ii. GEORGE SEEN KELLER, b. abt. 1680, m. "WIDOW" GOTH. iii. MARIA KATHERINE KELLER, b. May 17, 1696, Holzhauzen; d. May 22, 1768, Northampton County, Pennslvania. SABASTIAN KELLER (JACOBUS) b. June 20, 1659; d. March 10, 1733/34. Married JAKOBEA BOPPART on 30 Apr 1713. She was born in 1691.
i. SEBASTIAN KELLER, was born in Bernhardzell, St. Gallen, Switzerland and was baptized on 6 Feb 1715 in Bernhardzell, St. Gallen, Switzerland. ii. ANNA MARIA KELLER, was born in Bernhardzell, St. Gallen, Switzerland and died on 20 Jan 1728.
vi. SABASTIAN KELLER, was baptized on 1 Mar 1724. BASTIAN KELLER (JOHANNES, JACOBUS)was born 1680 in Schaffhausen, Switzerland. He married ELIZABETHA HILDEBRAND 1705 in Lancaster County, Pennsylvania, daughter of JOHN HILDEBRAND and MARY STIFFLER. She was born Abt. 1685 in Germany. 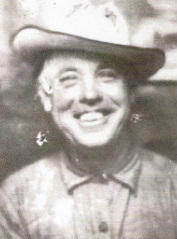 i. GEORGE KELLER SR., b. May 17, 1711, Weiler, Germany or Schwarzenackerm Swelbrucken, Bavaria; d. Bef. October 1782, Shenandoah County, Virginia. ii. MARIA ELIZABETHA KELLER, b. Abt. 1720, Germany or Switzerland. vi. JACOB KELLER, b. September 21, 1702.
viii. ANNA MARIA KELLER, b. Abt. 1707, Weiler, Elsez, Germany. ix. JOSEPH KELLER, b. May 15, 1719, Schwartznacker, Swelbrucken, Bavaria. GEORGE KELLER SR. (BASTIAN KELLER, JOHANNES, JACOBUS) was born May 17, 1711 in Weiler, Germany or Schwarzenackerm Swelbrucken, Bavaria, and died Bef. October 1782 in Shenandoah County, Virginia. He married BARBARA ANNA HOTTEL June 1733 in Lancaster County, Pennsylvania, daughter of JOHANNES HOTTEL and ELIZABETHA LNU. She was born December 02, 1713 in Alsheim Bei Gronau, Germany, and died 1783 in Woodstock, Shenandoah County, Virginia. The Palatinate or German Pfalz was subject to invasion by the armies of Britain, France, and Germany. As well as the devastating effects of war, the Palatines were subjected to the winter of 1708 and 1709, the harshest in 100 years. The scene was set for a mass migration. At the invitation of Queen Anne in the spring of 1709, about 7 000 harassed Palatines sailed down the Rhine to Rotterdam. From there, about 3000 were dispatched to America, either directly or via England, under the auspices of William Penn. The remaining 4 000 were sent via England to Ireland to strengthen the protestant interest. In 1710, three large groups of Palatines sailed from London. The first went to Ireland, the second to Carolina and the third to New York with the new Governor, Robert Hunter. There were 3 000 Palatines on 10 ships that sailed for New York and approximately 470 died on the voyage or shortly after their arrival. Over the next 100 years, impoverished Palatines fled from Germany to America - many arriving in Pennsylvania. George Keller came to America with forty two other Palatines and their families on board the Ship Pleasant, James Morris, Master, coming from Rotterdam Arrived in Philadelphia, Pennsylvania 10/11/1732. Before 1749 George Keller and his family moved to Virginia. He was a prominent churchman, and one of the Justices of the Peace of the first court of Dunmore---later renamed Shenandoah---County, Virginia. The court system in the colony of Virginia was a combination of traditional English doctrines with additional rules for unique situations. Most non-capital criminal cases began and ended in the county courts, as did most civil lawsuits. Holding court in the counties were the Justices of the Peace, also referred to as the Magistrates or the Gentlemen Justices. Besides their judicial duties, the Justices directed the laying out of roads, the location of bridges, appointed road surveyors and imposed fines on those who neglected to maintain their assigned sections of highways. They licensed water mills, ordinaries, ferries and courthouses. The Justices even advised the colonial legislature on the placement of warehouses, ferries churches and courthouses in their counties. There were eight Justices per county with a quorum of four to conduct judicial business. How often the county courts met was contingent upon many variables: the weather, conditions of the roads, the crop cycles, the number of cases filed and the availability of the Gentlemen Justices. All county Justices served at the appointment of the Royal Governor. A vacancy on the county court usually arose with the death of a Justice. The remaining Justices submitted a worthy gentleman's name to the Governor for his consideration. The worthy gentleman was a "Justice in waiting". He was a gentleman of impeccable reputation and honor. He was a respected individual within his community. He had served a "Justice" apprenticeship in governmental functions. This apprenticeship involved serving as a juror, overseeing the performance of wills, viewing property to ascertain ownership, the examination of disputed accounts, estate appraisals of deceased persons and orphans, and assisting the court in determining damages. He gained his legal expertise through "on the job training" and observing his more experienced colleagues. In 1772, the tax-paying population of Frederick County had reached adequate size to support the formation of a new county. This new county was Dunmore (later renamed Shenandoah), named for Governor John Murray, the Earl of Dunmore. From the four ethnic groups, Governor Dunmore appointed the first Justices. Of those eight worthy gentlemen, one was George Keller from the headwaters of Toms Brook. Let us now "flesh out" the gentleman justice, George Keller. We know that he had served his "Justice in waiting" apprenticeship. He was highly respected and had great influence in his community. George Keller was important enough to come to the attention of the Royal Governor. He could understand and speak the English Language. As German was his native language, he could function as a translator when necessary. He was highly respected and had great influence in his county. He was intelligent, as he had to attend to public business by administrating justice. He had an impeccable reputation and great personal honor. Less than 200 years ago not a white man dwelt in the Shenandoah Valley of Virginia. Scientists claim it was at one time a lake, evidenced by the discovery of fossils and sea shells high up on the mountains. When discovered by the white man it was a blooming prairie, the only timber being along the rivers and creeks. It was then a dark and terrible wilderness, the home of the Red Man, where the reckless hunter and daring adventurer feared to pass. Wild game, fur bearing animals of all descriptions, wild fowl and fish abounded there. In 1716, Gov . Spottswood with a party of 50 gallant "Knights of the Golden Horseshoe" breasted the steep slopes and tangled underbrush of the Blue Ridge Mountains coming at last to the summit at " Swift Run Gap" He was the first white man to behold the Valley in its primitive beauty. Hence this entire section drained by the Shenandoah River was named in honor of Governor Spottswood. It was once the immense county of Spottsylvania. In 1734 there was a division of Spottsylvania and the valley became a part of Orange. In 1738 it was again divided and became the two counties, Frederick and Augusta. Dunmore County was taken from Frederick in 1772 and in 1777 the Legislature altered the name of Dunmore to Shenandoah. Rockingham County was organized in 1778. Other divisions were soon made. This country was long overrun by Indians of different tribes from whom it could not be bought, because there was a dispute as to the claimants. The influx of immigration to the valley began about 1732. Jost Hite, with his family, was one of the first settlers but he was soon followed by the Germans of Pennsylvania and other states. Some came direct to the valley on landing. Indians vanished into the shades of the forest as the whites enlarged the boundaries of civilization. Finally they all left the low country in the year 1754.
ii. JOHANNES KELLER, b. June 12, 1736, Lancaster County, Pennsylvania; d. November 04, 1800, Greene County, Tennessee. iii. ANNA KELLER, b. 1740, Lancaster, Pennsylvania. v. ELIZABETH KELLER, b. Abt. 1745, Pennsylvania. Married JOSEPH SNAPP. viii. GEORGE KELLER, b. April 19, 1758; m. BARBARA HANGER. ix. HENRY KELLER, b. Abt. 1759, Tom's Brook, Shenandoah County, Virginia; d. April 14, 1823.
iii. ELIZABETH KELLER, b. Bef. 1770; d. Aft. 1785; m. FREDERICK PARROTT, May 17, 1785; b. Bef. 1770; d. Aft. 1785.
iv. DANIEL KELLER, b. June 26, 1773, Shenandoah, Virginia; d. August 30, 1840, Greene County, Tennessee; m. CHRISTINA LAMOM. v. MARY KELLER, b. Bef. 1774; d. Abt. 1843; m. (2) DAVID M. KEY. vi. JACOB KELLER, b. Abt. 1780, Greene, Tennessee; d. Aft. 1806; m. ANGELINE LINDSEY, February 06, 1806, Shenandoah, Virginia; b. Bef. 1791; d. Aft. 1815.
ii. BENJAMIN KELLER JR., b. Abt. 1806, Greene County, Tennessee; m. RACHEL MORRISON, February 03, 1827, Greene County, Tennessee. iii. MARY KELLER, b. Abt. 1808; m. WILLIAM BLACKETER. iv. SAMUEL KELLER, b. Abt. 1808, Greene County, Tennessee; m. HANNAH WINTERS, June 15, 1839, Parke County, Indiana. vi. SARAH KELLER, b. Abt. 1818, Greene Co., Tennessee; m. JOHN CRAGER, July 06, 1837, Parke County, Indiana. vii. MAHALA KELLER, b. October 11, 1821, Greene County, Tennessee; d. March 12, 1878, Tioga, Rose Hill, White Oak Township, Mahaska County, Iowa; m. HOCKETT ROBBINS, February 11, 1847, Greene County, Tennessee; b. September 15, 1821, Randolph County, North Carolina; d. May 10, 1897, Tioga, Rose Hill, White Oak Township, Mahaska County, Iowa. viii. RHEABOAM KELLER, b. Abt. 1825, Greene County, Tennessee; d. Bef. 1877, Parke County, Indiana; m. MELVINA STAGGS, March 07, 1847, Parke County, Indiana; b. 1827; d. Bef. September 1877, Parke County, Indiana. Rheaboam Keller's name was listed in the 1850 census of Sugar Creek Township, Parke County, Indiana. ix. SUSANNAH KELLER, b. Abt. 1828, Tennessee; d. Abt. 1870, Mahaska County, Iowa; m. JACOB WINDEL, September 23, 1841, Parke County, Indiana. x. ELIDA KELLER, b. Abt. 1829, Tennessee; m. ELIZA JANE FLETCHER, June 15, 1851, Parke County, Indiana. xi. ELIZABETH KELLER, b. Abt. 1830; m. SAMUEL OSBORNE, March 13, 1851, Parke County, Indiana. ELIZABETH KELLER (JOHANNES, GEORGE, BASTIAN KELLER, JOHANNES, JACOBUS) b. Bef. 1770; d. Aft. 1785; m. FREDERICK PARROTT, May 17, 1785; b. 1764 in Toms Brook, Shenandoah, Virginia, d. May 8, 1842 in South Salem, Ross, Ohio. i. JOHN PARROTT, b. 24 Feb 1786; d. 20 Aug 1859, Ross County, Ohio. ii. JOSEPH F. PARROTT, b. 20 Sep 1791.
iii. SARAH PARROTT, b. 1792.
iv. GEORGE PARROTT, b. 24 Oct 1793, Tom Brooks, Shenandoah, Virginia; d. 22 Sep 1863, Ohio. v. RACHEL PARROTT, b. 1800.
vi. REBECCA PARROTT, b. 24 Mar 1802; d. 23 Dec 1879.
vii. ELIZABETH PARROTT, b. 09 Jun 1804.
viii. MARY PARROTT, b. 1805.
ix. HENRY PARROTT, b. 11 Oct 1806; d. 11 Apr 1883.
x. BARBARA PARROTT, b. 18 Aug 1809; d. 12 Sep 1884.
xi. ANNA CATHERINE PARROTT, b. 12 Aug 1812; d. 22 Aug 1882. MARY KELLER (JOHANNES, GEORGE, BASTIAN KELLER, JOHANNES, JACOBUS) b. May 1771 in Shenandoah, Virginia, d. 1843 in Greene, Tennessee. m. in Shenandoah, Virginia to (1) SAMUEL HOSCHER, b. after May 1771 in Shenandoah, Virginia. m. (2) DAVID M. KEY. DAVID and MARY KEY burial: Anchor Cemetery, Greene, Tennessee. **** There was a lawsuit testing the validity of this will brought by heirs of law and of Mary Key, namely: Peter Key, John M. Harmon, James Saunders, William Ross Junr. ****Will to stand.........The contested case was tried in Circuit Court, June Term 1849, Hon, I.W. Luckey, Judge, Presiding. Jury, John Link, Andrew Miller, Warner Peters, Charles Lovett, William G. Morris, Joseph Galbreath, Joseph Johnson, Esq., Thomas L. Hale, Adam E. Dinsmore, John Fraker, John Walker and Leander Harmon. Plaintiff to recover against defendants -Peter Key, John M. Harmon, James Lenders and William Ross Jr.
JACOB KELLER (JOHANNES, GEORGE, BASTIAN KELLER, JOHANNES, JACOBUS) b. Abt. 1780, Greene, Tennessee; d. Aft. 1806; m. ANGELINE LINDSEY, February 06, 1806, Shenandoah, Virginia; b. Bef. 1791; d. Aft. 1815. HOCKETT ROBBINS OBITUARY: Hockett Robbins dies at his home near Tioga, May 10, 1897 from heart failure. Hockett Robbins age 75 years and 8 months had been ailing for some months but had been out walking around a few minutes before he died. Hockett Robbins was born in Randolph County, North Carolina, September 15, 1821. 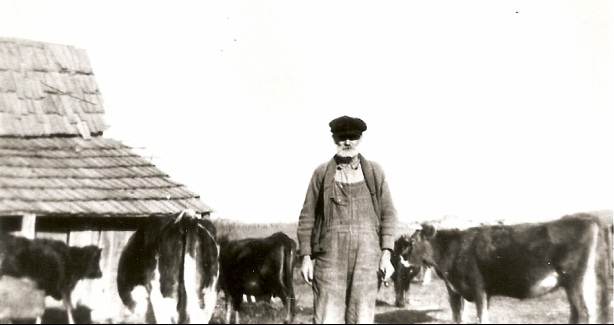 He first moved to Indiana and came to Iowa in 1854 locating on the farm where he lived until the day of his death. He married Mahala Keller, to them born 4 boys and 3 girls who were all present at the funeral. He joined the ME Church in 1858 and united in 1865 with the Baptist Church. He was a republican. Some years ago his wife passed on leaving him with 7 children. Later he married Mrs. Matilda Hinkle who with the children grown survived him. The funeral was conducted by Rev. G. M. Valingdingshom. The remains were interred in the Taylor Cemetery [Tioga Cemetery] by his first companion. ELIDA KELLER (BENJAMIN, JOHANNES,GEORGE, BASTIAN KELLER, JOHANNES, JACOBUS) b. January 3, 1828, Greene County, Tennessee, d. November 6, 1897, married June 15, 1851 Sugar Creek, ELIZA JANE FLETCHER, b. March 1,1835 ; d. March 15, 1923. Daughter of WILLIAM FLETCHER, b.was born March 20, 1810 in Hancock, Tennessee, and died August 01, 1847 in Indiana. He married (1) EMELINE CHURCH. He married (2) JANE MAY on July 03, 1843 in Parke County, Indiana. ELIZA JANE FLETCHER'S Mother was JANE MAY born 1813 in Tennessee. ELIDA KELLER burial at Zackmire Cemetery, Wallace, Fountain County, Indiana. On the 1850 Census for Parke County, Indiana ELIZA JANE FLETCHER is listed as living with her brother JAMES (16)- farmer, she was listed as being 14, WILLIAM (11), ELIZABETH (8) and MARY A. (4). No adults listed in household. ELIDA and ELIZA KELLER burial: Zackmire Cemetery, Wallace, Fountain County, Indiana. v. NARCISSA A. KELLER, b. 1866, d. June 23,1958, m. JACOB V. PHILPOTT, b. 1863, d. February 10, 1927. RHEABOAM KELLER (BENJAMIN, JOHANNES, GEORGE, BASTIAN KELLER, JOHANNES, JACOBUS) b. 1826 in Greene County, Tennessee; d. Bef. 1877, Parke County, Indiana; m. MELVINA STAGGS, March 07, 1847, Parke County, Indiana; b. 1827 in Indiana; d. Bef. September 1877, Parke County, Indiana. Rheaboam Keller's name was listed in the 1850 census of Sugar Creek Township, Parke County, Indiana. Real estate value listed at $1000. (see image). Found on the 1860 census in Sugar Creek, Parke County, Indiana. Post office listed at Russell Mills. Rheaboam is listed as a farmer and age 33 and Melvina is 31. Chlldren listed are: George W. (9), James J. (7), Artemisia (4), Jacob (4 months). Found on the 1870 census in Sugar Creek, Parke County, Indiana. Rheaboam is listed as a farmer with real estate valued at $4800 and personal property valued at $1000. He is 46 and Melvina is 44. Chlldren listed are: James J. (17), Artemisia (14), Jacob (11), Erastus (9) and Julia Ann (1). i. JOHN R. KELLER, b. 1850, Parke County, Indiana. ii. GEORGE W. KELLER, b. Abt. 1851, Parke County, Indiana; m. JULIA. iii. JAMES J. KELLER, b. September 1853; m. EMILY C. HAGA, January 23, 1878, Parke County, Indiana. iv. ARTEMISIA KELLER, b. February 23, 1856, Parke County, Indiana; d. February 24, 1880. m. ALFRED P. CHAPMAN, July 24, 1873, Parke County, Indiana. v. ERASTUS KELLER, b. Abt. 1859, Parke County, Indiana. vi. JACOB NATHANIEL KELLER, b. May 05, 1860, Parke County, Indiana; d. December 11, 1932, Independence County, Arkansas. vii. JULIA ANN KELLER, b. Abt. 1869, Parke County, Indiana. State of Indiana, Parke County, Sugar Creek Township. and under 45 years of age, subject to military duty. ENOCH ROBBINS (MAHALA KELLER, BENJAMIN, JOHANNES,GEORGE, BASTIAN KELLER, JOHANNES, JACOBUS) b. January 8, 1849, Crawfordsville, Parks, Indiana, d. January 25, 1921, married MARY ELIZABETH ALEXANDER, 11 OCT 1877 Mahaska Co., Iowa. She was born March 19, 1859, d. January 21, 1930 in Iowa. Both buried at Tioga Cemetery, Mahaska County, Iowa. OBITUARY: Mary Elizabeth Robbins, wife of Enoch Robbins, and daughter of Isaac and Mary Alexander was born March 19, 1859 near Springfield, and passed away at the Mahaska County Hospital in Oskaloosa, Tuesday, January 21, 1930, aged 70 years, 10 months and 2 days. She was united in marriage to Enoch Robbins October 11, 1877, who departed this life January 25, 1921. To this union were born 9 children: C. O. Robbins, of Martinsburg; Elmer Robbins of Yoder, Wyoming; Mrs. H. H. Glasscock of Omaha, Illinois; Alva Robbins of Florin, California; Bert Robbins of Pratt, Kansas; Mrs. V. W. Lock and Mr. V. W. Wolfe of Oskaloosa and Howard Robbins of Fremont. One son preceded her in death May 11, 1904. Surviving her are 24 grandchildren and one brother, Douglas Alexander of Tioga, also a host of other relatives and friends. The deceased was united with the Baptist Church in Fremont in girlhood. She was a faithful and devoted wife and mother who bore the hardships and sufferings of this life patiently to the end. i. DELLA PHILPOTT, b. April 10, 1892 in Parke County, Indiana. d. January 23, 1998 in Covington, Fountain County, Indiana. m. Cecil Raymond Glascock on Feb. 3, 1912. He died in March 1941.
ii. ALTA BERTHA PHILPOTT, b. February 10, 1898 in Fountain County, Indiana. d. 1995 in Logansport, Cass County, Indiana. m. CHARLES L. BROWN Sept. 10, 1920. He died May 3, 1948. OBITUARY FOR DELLA PHILPOTT GLASCOCK: Della B. Glascock, 105, died at 2:30 pm Friday in the Covington Manor Health Care Center where she was a resident. Mrs. Gladock had lived in Covington, Veedersburg and Wallace, she attended Buffalo School in Fountain County's Jackson Township. Her memberships include Freedom Christian Church and the Wallace Order of Eastern Star, where she had been a member of more than 50 years. She was born April 10, 1892, in Parke County to Jacob Verner and Nurissa Alice Keller Philpott. She married Cecil Raymond Glascock on Feb. 3, 1912. He died in March 1941. Survivors include several nieces and nephews. She was preceded in death by two brothers and five sisters. The funeral service is scheduled for 11 am Monday in Zackmire Cemetery, located south of Wallace, with the Rev. Gary Johnson officiating. There will be no hours scheduled for visitation. Shoemaker Funeral home at Waynetown is in charge of arrangments. JACOB NATHANIEL KELLER (RHEABOAM, BENJAMIN, JOHANNES, GEORGE KELLER SR., BASTIAN KELLER, JOHANNES, JACOBUS) was born May 05, 1860 in Parke County, Indiana, and died December 11, 1932 in Independence County, Arkansas. He married LUEANNA GREEN December 14, 1882 in Paris, Sims Township, Edgar County, Illinois, daughter of CHARLES GREEN and RACHEL ROCK. She was born September 29, 1865 in Edgar County, Illinois, and died July 18, 1927 in Independence County, Arkansas. 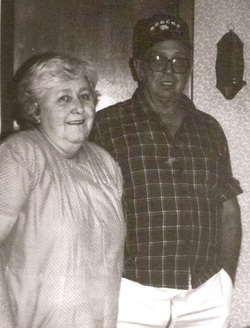 Jacob and Lueanna both lived in Paris, Sims Township, Illinois at the time of their marriage. Obituary for Jacob Nathaniel Keller read: "Jacob N. Keller was born in the year of 1860 May the 5th. Was 72 years, 7 months, and 7 days old. Was married to Miss Lueanna Green, December 14th, 1882. To their union was born 11 children, 2 were called away in infancy, 9 survived him. Was converted at about the age of 43 joining the Missionary Baptist Church having lived a Christian life until death." iv. LEONA KELLER, b. September 27, 1887, Illinois; d. 1952, Tuckerman, Jackson County, Arkansas. v. GEORGE LESLIE KELLER, b. July 26, 1888, Parke County, Indiana; d. June 05, 1953, Jay, Oklahoma; m. CHARLOTTE ZEIGLER, October 25, 1914, Oklahoma. ix. OSCAR KELLER, b. November 21, 1902, Ada, Oklahoma; d. November 04, 1976, Okemah, Okfuskee, Oklahoma; m. DOROTHY, 1927, Batesville, Arkansas. 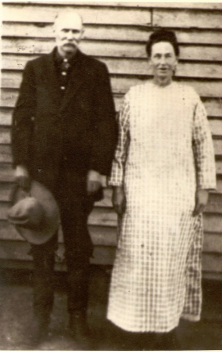 x. ANNABELL KELLER, b. November 14, 1905, Ada, Oklahoma; m. BENJAMIN MCCOY, January 06, 1934, Jackson County, Arkansas. xi. MARY JANE KELLER, b. September 02, 1907, Ada, Oklahoma; d. February 28, 1995, Batesville, Arkansas; m. CARL TRIPP, Independence County, Arkansas. ARTEMISIA KELLER (RHEABOAM, BENJAMIN, JOHANNES, GEORGE KELLER SR., BASTIAN KELLER, JOHANNES, JACOBUS) b. February 23, 1856, Parke County, Indiana; d. February 24, 1880. m. ALFRED CHAPMAN, July 24, 1873, Parke County, Indiana. ARTEMISIA KELLER Burial: Lindley Cemetery, Greentown, Indiana. iv. JACK WINGO, b. May 17, 1923, d. April 24, 2004 in Arkansas. Married HELEN MYERS December 25, 1945, daughter of JAMES MYERS and ANNIE GIFFORD. She was born November 20, 1929.
i. COLUMBUS RUPHERT WINGO, b. January 30, 1902, Ada, Pontotoc County, Oklahoma; d. March 25, 1970, Grubbs, Jackson County, Arkansas. ii. ROSIE MAE WINGO, b. July 23, 1905, Ada, Pontotoc County, Oklahoma; d. August 14, 1987, Palestine, Poinsett County, Arkansas. iii. MARY LOU WINGO, b. April 01, 1908, Francis, Pontotoc County, Oklahoma; d. October 30, 1949, Newport, Jackson County, Arkansas. iv. MILDRED GIFFORD, b. June 08, 1914; d. December 29, 1987.
vi. MARTHA JANE BELL GIFFORD, b. August 25, 1917, Tuckerman, AR; d. August 13, 1998, Tuckerman, AR. vii. ROBERT NATHANIEL GIFFORD, b. September 16, 1919.
viii. 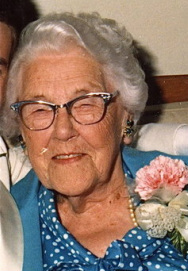 ETTA RAE GIFFORD, b. September 18, 1924; d. June 05, 2004, New Buffalo, Berrien County, Michigan. ix. ALTA GIFFORD, b. August 08, 1928. ELLIS- Troy Ray Keller, 77, died, Jan. 8, 2008, at Trego County-Lemke Memorial Hospital in WaKeeney. He was born Oct. 13, 1930, in Grubs, Ark., the son of George and Charlotte Ziegler Keller. He worked as a truck driver for Groendyke for 12 years and then worked for Koch Industries for 28 years as a Gager. 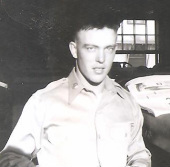 He was a U.S. Army veteran serving during the Korean War. On May 18, 1952, he married Norma Jean Hembree in Chase. She survives. Other survivors include: two sons, Jack Keller and Dave Keller, both of Ellis; two daughters, Linda Dunn and Judy Hagan, both of Ellis; a sister, Lucille, Locust Grove, Mo. ; four granddaughters; two grandsons; three great-grandsons; two great-granddaughters; four nephews; and two nieces. Services will be at 11 a.m. Friday at Wasinger Keithley Funeral Chapel, Ellis. Visitation will be from 5 to 8 p.m. Thursday and 10 a.m. until service time on Friday at the funeral chapel. Burial will be in Mount Hope Cemetery. Memorials are suggested to the American Diabetes Association. CHARLES ELMER KELLER (JACOB NATHANIEL, RHEABOAM, BENJAMIN, JOHANNES, GEORGE KELLER SR., BASTIAN KELLER, JOHANNES, JACOBUS) was born August 01, 1890 in Parke County, Indiana, and died June 27, 1960 in Newport, Arkansas. He married IRA LEE GIFFORD October 22, 1916 in Tuckerman, Jackson County, Arkansas, daughter of ROBERT GIFFORD and EMMA JACOBS. She was born July 03, 1900 in Tuckerman, Arkansas, and died March 10, 1986 in Batesville, Independence County, Arkansas. i. ROBERT LEE KELLER, b. August 03, 1917, Tuckerman, Arkansas; d. March 03, 1918, Tuckerman, Arkansas. ii. CLOVIS ELMER KELLER, b. November 03, 1919, Tuckerman, Arkansas; d. January 14, 1964, Newport, Arkansas; m. EMMA JEAN HOPKINS, January 14, 1962, Jackson County, Arkansas. vi. CHARLES HENRY KELLER, b. June 02, 1929, Cave City, Stone County, Arkansas; d. December 29, 1997.
viii. JOHNNY CLAY KELLER, b. October 08, 1933, Tuckerman, Arkansas; m. ALMA BICE, February 21, 1969, Tuckerman, Jackson County, Arkansas. She died March 9, 1996.
ix. ENIS RAY KELLER, b. Tuckerman, Arkansas; m. (1) ESTHER GLISPEY; m. (2) EMMA ELIZABETH ELLINGTON, September 11, 1965, Carson City, Ormsley, Nevada; b. November 04, 1939, Paragould, Greene County, Arkansas. x. BOBBY CLELLAN KELLER, b. Tuckerman, Arkansas; m. SYBIL RUTH ISAM, December 12, 1960, Visalia, Tulare, California. She died November 8, 1997.
xi. MABEL "MIDGE" LOUDEAN KELLER, b. Tuckerman, Arkansas; m. (1) JOSEPH MAYNARD; m. (2) JOHN RICHARD HUDNAIL; m. (3) JAMES SACKETT, November 04, 1958, Visalia, Tulare, California. Married (4) ROBERT KING, he died October 25, 1995.
xii. 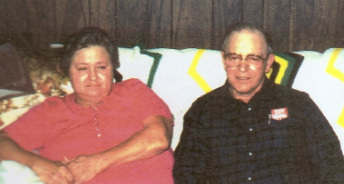 BILLIE CAROL KELLER, b. Tuckerman, Arkansas; m. KENNETH DRAKE, April 15, 1966, Tuckerman, Jackson County, Arkansas. i. LOU ANN KELLER, married MCLANE. MARY JANE KELLER (JACOB NATHANIEL, RHEABOAM, BENJAMIN, JOHANNES, GEORGE KELLER SR., BASTIAN KELLER, JOHANNES, JACOBUS), b. September 02, 1907, Ada, Oklahoma; d. February 28, 1995, Batesville, Arkansas; m. CARL GEORGE TRIPP, Independence County, Arkansas. JACK WINGO (ARTIE KELLER, JACOB NATHANIEL, RHEABOAM, BENJAMIN, JOHANNES, GEORGE KELLER SR., BASTIAN KELLER, JOHANNES, JACOBUS) was born May 17, 1923, and died April 24, 2004 in Arkansas. He married HELEN MYERS December 25, 1945, daughter of JAMES MYERS and ANNIE GIFFORD. She was born November 20, 1929. Mr. Jack P. Wingo, 78 of Tuckerman, died Wednesday, April 24, 2002 in Newport. He was born May 17, 1923 in Denton Island, the son of Benjamin Franklin and Artie (Keller) Wingo. 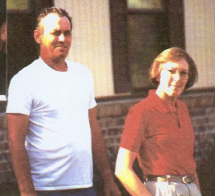 Mr. Wingo was a farmer and a member of the Faith Assembly of God Church in Tuckerman. 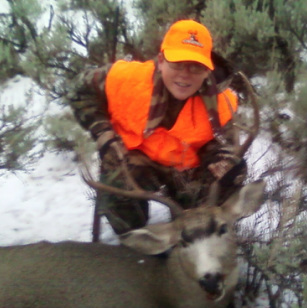 He enjoyed hunting, fishing, trapping, working in his garden and doing things for other people. 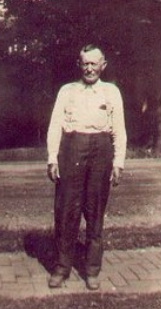 Mr. Wingo was preceded in death by five brothers, James Wingo, Delbert Wingo, Frankie Wingo, George Wingo, and Bill Wingo; three sisters, Annie Berry, Minnie Furgeson, and Millie Wingo. He is survived by his wife of 56 years, Helen (Myers) Wingo of Tuckerman; one daughter, Carolyn Johnson and Doug of Tuckerman; one brother, Elmer Wingo of Cash; eight grandchildren, Tammy Crosbie and husband, Kevin, Trent Davison and wife Lawanda, Devon Davison and wife, Julie, Felicity Johnson, Janelle Johnson, Eric Johnson and wife Cassondra, Jessica Johnson and Brian Johnson; eleven great-grandchildren, Britney Dawn Davison, Dominique Johnson, Kristen Davison, Anglee Davison, Jacob Crosbie, Kaigen Rogo, Ashtyn Rogo, Magan Johnson, Alissa Davison, Chance Jackson, Douglas Johnson, and Zack Robertson; many nieces and nephews and one special nephew, Jackie Gray. Funeral service was 4 p.m. Saturday at the Faith Assembly of God Church in Tuckerman with Bro. David Decker and Bro. Leroy Burnside officiating. Interment was in Gracelawn Cemetery. Pallbearers were Scotty Crabb, Orville McManners, George Jacobs, Alf Eads, Chris Clark, Rickey Haney and Billy Davis. Honorary pallbearers were Richard Smith, Jessie Dicus, Harold Winchester, Jessie Dunivan, Doyle Riley, and Dickie Hembrey. Arrangements by Jackson's Newport Funeral Home. i. PATRICIA SHIPMAN, m. WILLIAM MERRELL, April 15, 1963, Jackson County, Arkansas. ii. MELBA KAYE KELLER, m. PHILIP MOOREHEAD, March 21, 1966, Jackson County, Arkansas. iii. MARY SUE KELLER married NAGEL. iv. CONNIE KELLER married PATE. ENIS RAY KELLER (CHARLES ELMER, JACOB NATHANIEL, RHEABOAM, BENJAMIN, JOHANNES, GEORGE KELLER SR., BASTIAN KELLER, JOHANNES, JACOBUS) was born in Tuckerman, Arkansas. He married (1) ESTHER GLISPEY. He married (2) EMMA ELIZABETH ELLINGTON September 11, 1965 in Carson City, Ormsley, Nevada. She was born November 04, 1939 in Paragould, Greene County, Arkansas. i. ROBERT WAYNE KELLER, b. October 16, 1966, Visalia, Tulare, California; m. VICTORIA SALDANA, April 13, 1996, Lake Tahoe, California. BOBBY CLELLAN KELLER (CHARLES ELMER, JACOB NATHANIEL, RHEABOAM, BENJAMIN, JOHANNES, GEORGE KELLER SR., BASTIAN KELLER, JOHANNES, JACOBUS), b. Tuckerman, Arkansas; m. SYBIL RUTH ISAM, December 12, 1960, Visalia, Tulare, California. She died November 8, 1997. MABEL "MIDGE" LOUDEAN KELLER (CHARLES ELMER, JACOB NATHANIEL, RHEABOAM, BENJAMIN, JOHANNES, GEORGE KELLER SR., BASTIAN KELLER, JOHANNES, JACOBUS) was born in Tuckerman, Arkansas. She married (1) JAMES SACKETT November 04, 1958 in Visalia, Tulare, California. She married (2) JOSEPH MAYNARD. She married (3) JOHN RICHARD HUDNAIL. She married (4) BUD WRIGHT. Mrs. Mabel (Keller) Wright, 70, of Newport died Thursday, October 11, 2012. She was born March 5, 1942 at Eden Isle Community in Grubbs, the daughter of Charles Elmer and Ira Lee (Gifford) Keller. Mrs. Wright was retired from American Lantern and Thomas-Betts, and was of the Baptist belief. 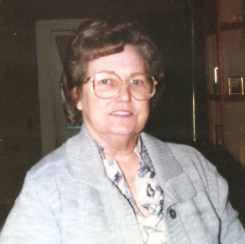 She enjoyed reading, and spending time with her grandchildren and dogs. 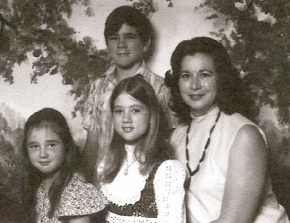 Mrs. Wright was preceded in death by one son, Anthony Dean Sackett; six brothers; and two sisters. She was survived by her husband, R. E. “Bud Wright who later died on October 13, 2012; one son, James Edward Sackett, Jr., and wife Cheryl of Wyoming; three daughters, Mary Elaine Sackett of Benton, Kimberley Kay Drury of Weekiwache, Florida, and Tracey Jean Sponer and husband Thomas of North Little Rock; two brothers, Bobby Clellan Keller and Enis Keller, both of California; one sister, Billie Carol Drake of Fayetteville; ten grandchildren, Jimmy Sackett, Missy Sackett, Crystal Sackett, Shawna Bell, Sarah Cooprider, D.J. Bomesberger, Christopher Shane Adcox, Angelia Beth Drury, Samuel Trever McGinnis, and Charles Matthew McGinnis; and ten great-grandchildren. Memorial services will be 3:00 p.m. Thursday at Jackson’s Newport Funeral Home Chapel. BILLIE CAROL KELLER (CHARLES ELMER, JACOB NATHANIEL, RHEABOAM, BENJAMIN, JOHANNES, GEORGE KELLER SR., BASTIAN KELLER, JOHANNES, JACOBUS) , b. Tuckerman, Arkansas; m. KENNETH DRAKE, April 15, 1966, Tuckerman, Jackson County, Arkansas. CAROLYN SUE WINGO (JACK, ARTIE KELLER, JACOB NATHANIEL, RHEABOAM, BENJAMIN, JOHANNES, GEORGE KELLER SR., BASTIAN KELLER, JOHANNES, JACOBUS). She married (1) DAVISON. She married (2) DOUG JOHNSON. i. TAMMY DAVISON, m. KEVIN CROSBIE. ii. TRENT DAVISON, m. LAWANDA. iii. DEVON DAVISON, m. JULIE. vi. ERIC JOHNSON, m. CASSONDRA. MELBA KAYE KELLER (ELVIE, CHARLES ELMER, JACOB NATHANIEL, RHEABOAM, BENJAMIN, JOHANNES, GEORGE KELLER SR., BASTIAN KELLER, JOHANNES, JACOBUS) m. PHILIP MOOREHEAD, March 21, 1966, Jackson County, Arkansas. Died August 14, 2009. 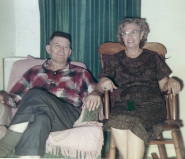 CONNIE KELLER (ELVIE, CHARLES ELMER, JACOB NATHANIEL, RHEABOAM, BENJAMIN, JOHANNES, GEORGE KELLER SR., BASTIAN KELLER, JOHANNES, JACOBUS) married PATE. RODGER KELLER (BOBBY, CHARLES ELMER, JACOB NATHANIEL, RHEABOAM, BENJAMIN, JOHANNES, GEORGE KELLER SR., BASTIAN KELLER, JOHANNES, JACOBUS) married (1) SHEILA GREGOR in 1993, divorced in 2003. Married (2) JANENE LA FLEUR in 2006. His second marrriage inclided three step-daughters: HEATHER, MEGAN and PARIS.